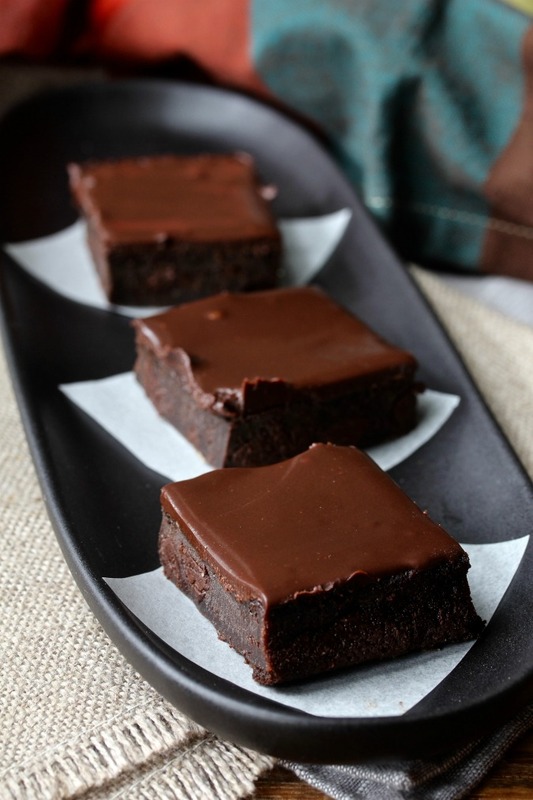 These zucchini brownies are so dense and chocolatey, and pretty much hide the fact that there are veggies in there. 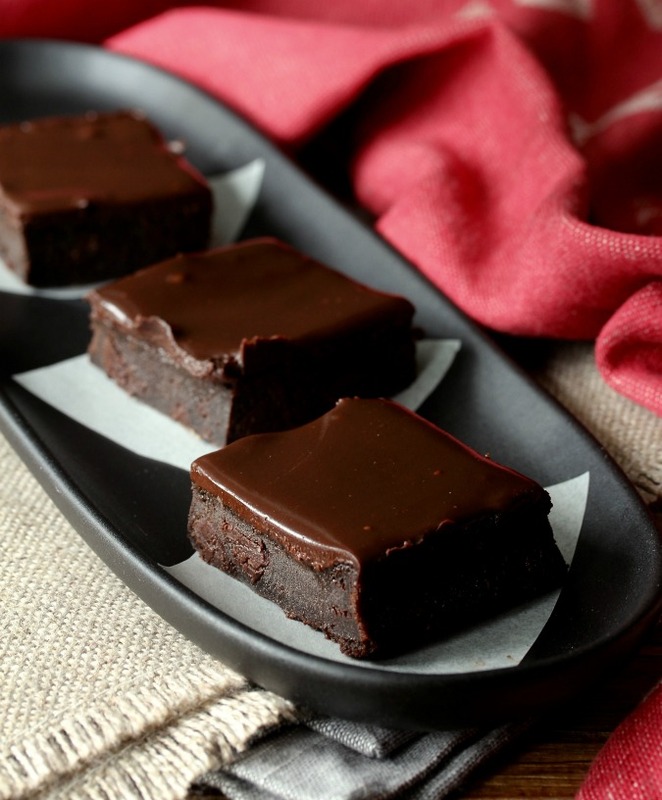 These fudge-like brownies include a zucchini puree, along with Dutch process cocoa, espresso powder, and bittersweet chocolate chips. The brownies are definitely moist from the zucchini, and the zucchini disappears from sight because it is pureed rather than shredded. 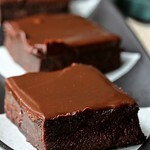 If you don't tell the kids (in my case, grandsons) that there are veggies in these brownies, the kids will eat them up. I love the ganache frosting too, however, if you don't want to frost these, just know that the the brownies don't look like brownies on top (maybe it's from the zucchini), but they will still be delicious. The recipe for these zucchini brownies calls for just 2 ounces of flour for 16 brownies. That's just 1/8 of an ounce per brownie (I'm such a mathematician, right?). 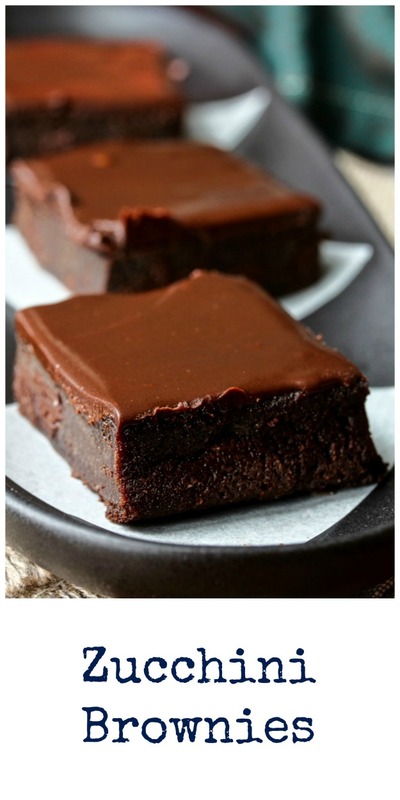 Chocolate pretty much dominates in these brownies. Note: I prefer to use Dutch process cocoa with this recipe, but if you prefer to use natural cocoa, the brownies will be fine. However, I do really like the super dark color and the rich, smooth flavor of Dutch process cocoa. The process of alkalizing the cocoa reduces some of the sourness and bitterness of cocoa powder. 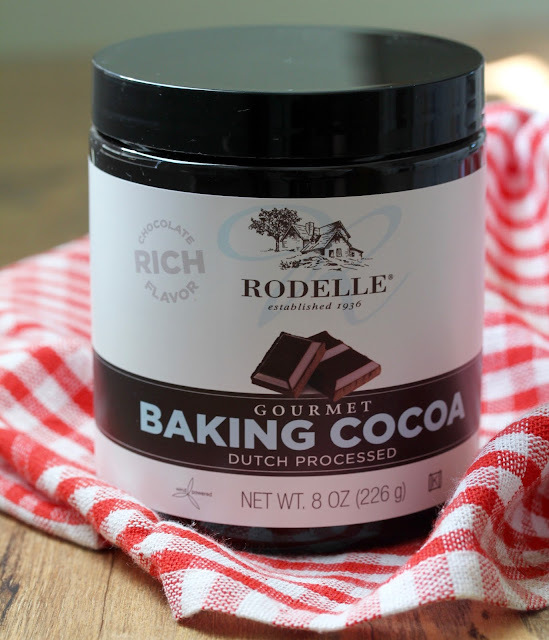 The brand I used was Rodelle Baking Cocoa. I loved the richness and amazing dark color. Disclosure: Rodelle sent me a sample of their cocoa to try for #Choctoberfest. Today is the last day of #choctoberfest. What is Choctoberfest? It's a group of 70+ bloggers who posted 200+ recipes featuring chocolate from October 16 to October 21. Many thanks to Allison of the Pintertest Kitchen for putting this together. After the recipe, be sure to check out the rest of the participants' chocolate creations. 8 ounces zucchini, cut into chunks. If you don't have a scale, 8 ounces is the equivalent to about 1 1/2 cups of shredded zucchini. Preheat the oven to 350 degrees F and spray a nine inch square pan with spray oil. Add the zucchini, butter, eggs, and vanilla to a food processor and process until you have a smooth mixture. Add the sugar, cocoa, espresso, baking powder, salt, and flour. Pulse the ingredients until just combined. Add the chocolate chips and pulse a few times, until the chips are slightly broken up. Pour the mixture into your prepared baking pan, and bake for 25 to 30 minutes, until a cake tester or toothpick comes out with out any wet batter on it. Allow the brownies to cool in the pan on a wire rack. Add the chips and heavy cream to a small saucepan and cook over low heat, stirring constantly, until the chips are soft. Remove from the heat and stir until smooth. I could swear I left a comment, then realized I did so over at Facebook... you know I am in absolute love with your plate, and in fact I've been flirting with it... I love colorful stuff, but black and white has instant appeal... and this plate... WOW!